Since 2009, Portuguese footwear exports increased by more than 50%, from 1 232 million euros achieved in that year to a new record of almost 1 900 million reached in 2015. 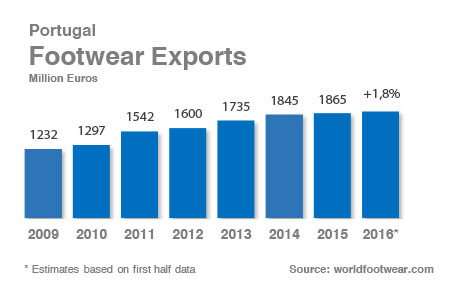 Based on the numbers for the first semester, with sales abroad growing by 1.8% from similar period in 2015, and assuming no major disruption occurs, the current year will be the 7th of continued growth for the Portuguese footwear industry and its exports. During the first half of 2016, Portuguese footwear exports grew across all relevant markets. The EU continues to be the major destination region for Portuguese footwear, and in the first semester of the current year a total of 35.8 million pairs with a global value of 788.7 million euros were exported to the 28 countries of the European Union, which now represents 87.4% of all Portuguese sales abroad. Compared with similar period in 2015, this led to an increase of 2.8% in the total footwear exports to EU countries. This resulted from the good performance in four of the top five buyers of Portuguese footwear within the European Union. France, the main market for Portuguese footwear has increased its orders by 1.5% in the period and has crossed the 195 million euros’ threshold. Sales to Spain (93.6 million euros) and the United Kingdom, increasing by 9.0% and 6.6%, respectively, contributed to the overall good performance of Portuguese footwear in the region. If the EU is still the main market for Portuguese products, the industry is looking to grow in other markets outside this area. Despite the already expected fall in exports to markets such as Angola and Russia, Portuguese companies continued to conquer share in markets outside Europe. During the first semester, Portuguese footwear exports revealed a particularly dynamic growth in markets such the US (growing by 13.6% and totaling 33.8 million euros), China (increasing by 29.8% and reaching 6.7 million euros) and Australia (a growth rate of 23.5% resulted in 6.5 million euros of sales). Overall, Portuguese footwear exports represent more than 95% of the country’s total production, with the products reaching customers in 152 countries across the world.